You can find more information about R packages in our install manual. An experiment design file defining the experimental groups, time slots, for time course experiments, and replicates. The first experimental group is considered the control group. See Experiment Design File Format for details. A data file containing transcript level raw counts for one or more experimental groups and one or more time points with at least two replicates each. You must provide raw counts in the expression matrix; they are required for some statistical analyses. Internally, the application maintains a copy of the original raw counts matrix as well as a normalized copy. See Expression Matrix File Format for details. 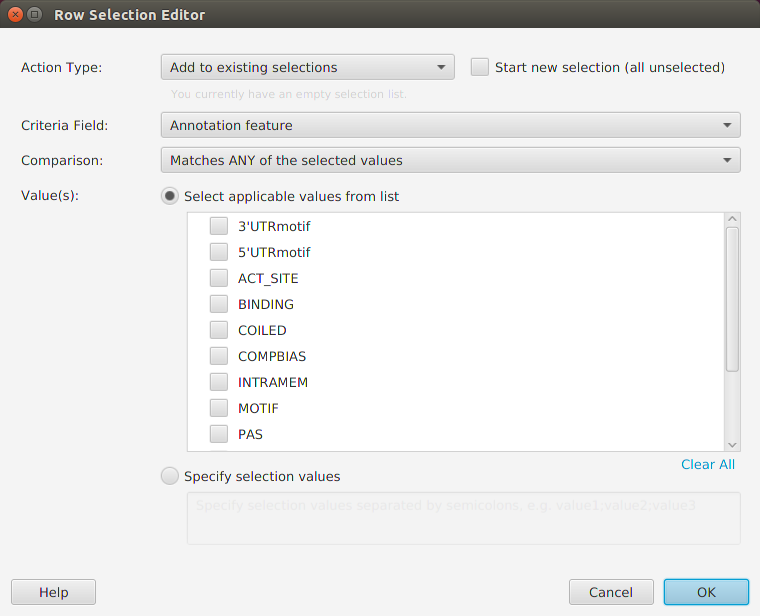 See Annotation Features File Format for details. 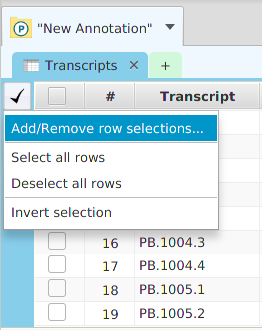 An optional filter for removing transcripts with low expression levels and inconsistent expression values across samples. An optional transcripts filter for removing unwanted transcripts. You may provide an inclusion list, for transcripts to include, or an exclusion list for transcripts to filter out. You may, for example, initially bring in all the data into a project and then use the application’s ad hoc queries, or analysis results, to generate, and export, a transcripts list. You may then reinput the data into the project applying the exported transcript list as a filter. The project data consists of all the transcripts that remain after filtering, along with their corresponding annotation features. Transcripts that are filtered out are no longer part of the project data. For example, if a gene contains 5 isoforms and two of them are filtered out, the application data will only have 3 isoforms for the gene. If all isoforms for a gene are filtered out, the gene will no longer be part of the project data. It is important that you understand that from the application’s perspective, the data included in the project represents the ‘universe’ for the project. Genes and transcripts that are not part of the project data are not taken into account in any way by the application. 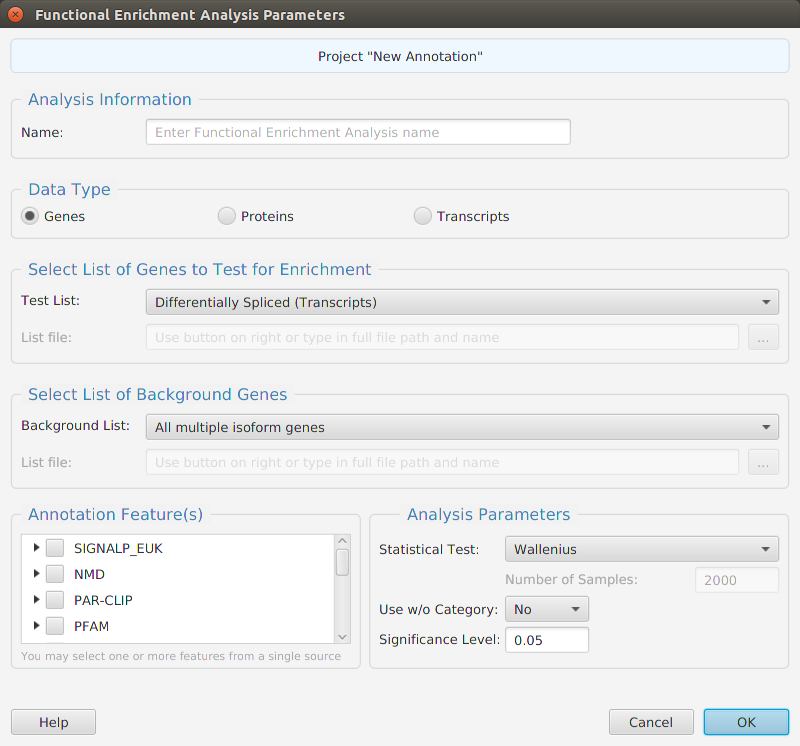 For example, when using ‘All genes’ in a data analysis, it refers to all genes in the project data not all genes for the species or all genes in the annotation file. You may reinput the data for a project at any time; however, all existing analysis results will be cleared. As previously stated, the application keeps a copy of the original raw counts expression matrix and also creates a new matrix using normalized counts. The Trim Mean of M (TMM) normalization procedure by Robinson and Oshlack, provided in the R package NOISeq, is used to normalize the data. The design file will change depending on the experiment type. However, regardless of experiment type, it is possible to use the same expression matrix and just modify the design file. By doing so, you have the option to run case-control analysis, and time-course single series analysis using the data from a time-course multiple series experiment. You may also, leave out replicates, time slots, etc. without having to make any changes to the expression matrix. The case-control design file must contain two experimental groups. Each group must contain at least two replicates. The single series time-course design file must contain a single experimental group. The group must contain at least two time slots with a minimum of two replicates per time slot. The multiple series time-course design file must contain at least two experimental groups. Each group must contain at least two time slots with a minimum of two replicates per time slot. 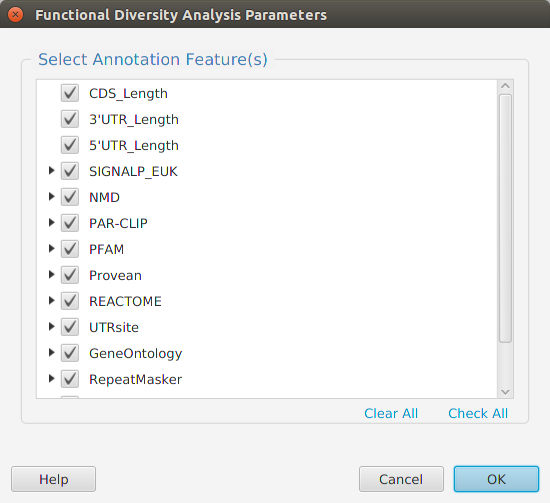 Transcript Level Feature Annotations – basic transcript information, UTR motifs, microRNAs, etc. Genomic Level Feature Annotations – exons, splice junctions, etc. 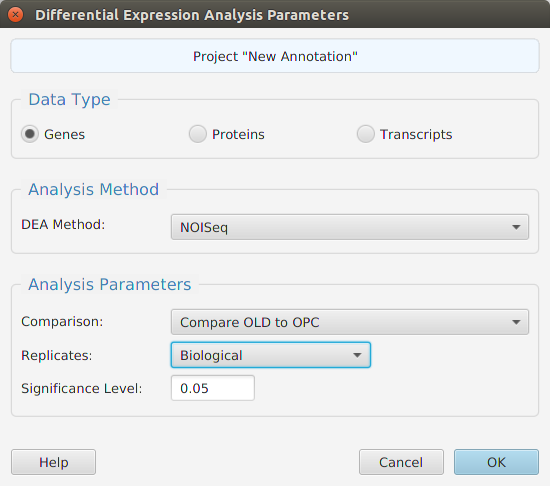 Protein Level Feature Annotations – gene ontology features, domains, phosphorylation sites, etc. Generating an annotation file is not a trivial task and it’s not recommended unless you have a good programming background and knowledge of annotation features. If possible, use one of the annotation files provided by the application. If no annotation file is provided for the species you are interested in, you may contact us . tappAS is a Java application and its Graphical User Interface (GUI) is based on JavaFX. Using JavaFX allows the application to work across multiple Operating Systems (OS) and provide the same look and feel of native applications. In addition, JavaFX allows the application to provide the rich set of features expected from a modern GUI application. The application layout consists of 3 main sections: a top tool bar and two tab panels, a data tab panel on top and a data visualization tab panel on the bottom, see image below. Located after the menu buttons, are the data table search text field and the filter checkbox controls. These controls apply to the currently selected data table, in one of the subtabs below, and as their name implies, are used for searching and table row filtering purposes. Finally, all the way on the left, there is a menu button to access miscellaneous application functions. The top tab panel is used to display data tabs for all opened projects. The bottom tab panel is used to display data visualization tabs for all opened projects. 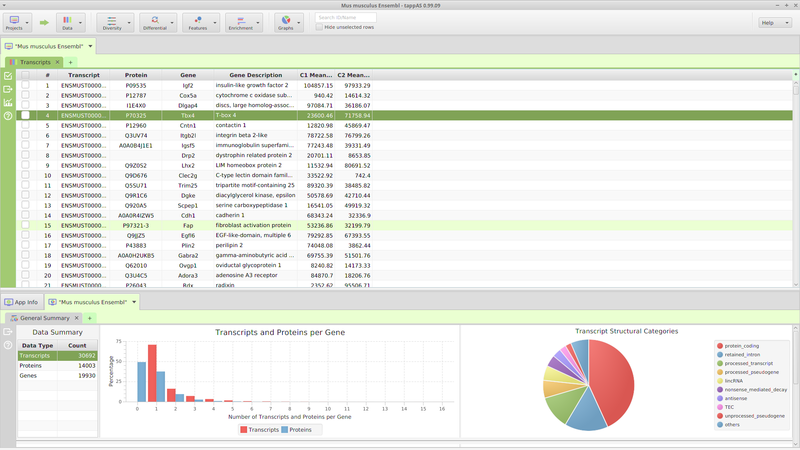 In addition, gene data visualization tabs and the global application tab are also displayed here. Data tabs, one per project, contain project data subtabs. Data visualization tabs, one per project, contain project data visualization subtabs. 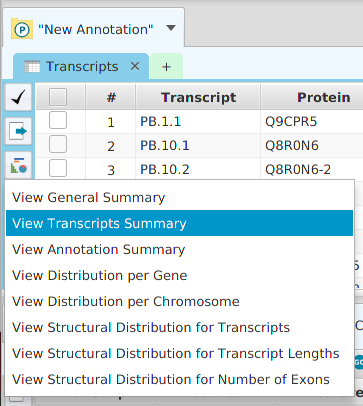 Gene data visualization tabs, one per gene – project specific, contain gene data visualization subtabs. Annotation source tab, one per application, contains annotation features details and data visualization subtabs for selected annotation source. Application tab, one per application, contains application information subtabs. A subtab is where the actual information display takes place, i.e. tables, charts, etc. There are lots of different subtabs in the application and they are grouped logically into the tab in which they are contained. Each subtab has a menu bar containing graphical menu buttons that provide access to subtab specific functionality. Tabs and subtabs will be discussed in details in the Tabs section. In addition to all the visible menu buttons in the application, there are context-sensitive menus all over the application that are not visible. Context-sensitive menus are popup menus that are only shown as a result of a right-click with the mouse on a user interface display element. The menu item selections shown, and/or the actual data displayed when a selection is made, will vary based on what display element, or even what part of it, was right-clicked. For example, gene data visualization is accessed via context menus, what gene the data visualization is shown for depends on what row of the data table the right-click took place on, see image below. The same row specific context display applies to drill down data displays. Application functionality can sometimes be accessed more efficiently via context menus. For example, if you have multiple display elements on a data visualization subtab, you may right-click on the display element you are interested in and the export menu selection shown in the context menu will be exclusively for that element. 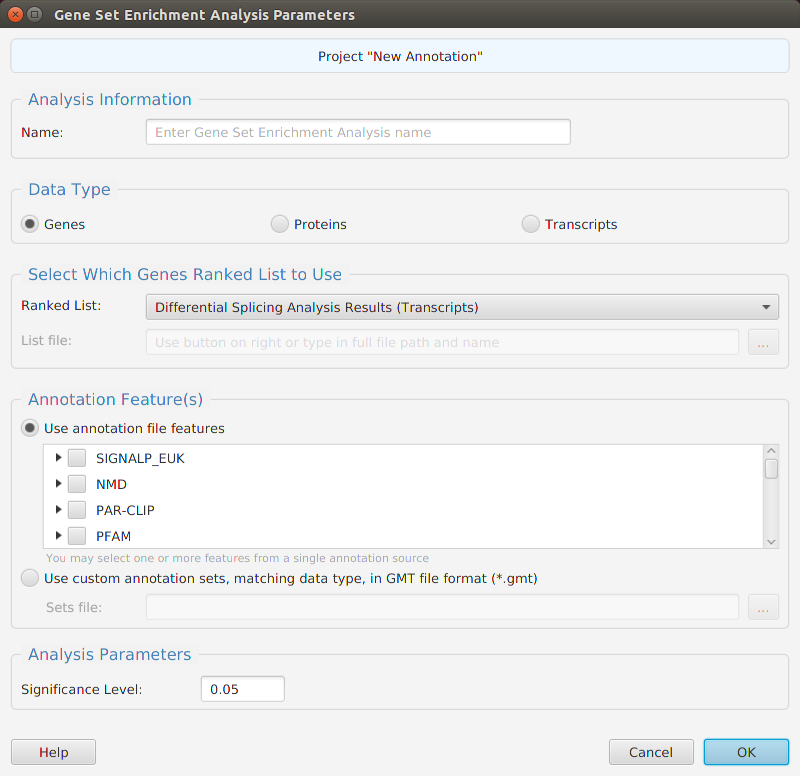 The gene data visualization and drill down data, previously mentioned, are examples of functionality that is only accessible via context menus. Make sure to not miss out on application functionality accessible only in context menus: when in doubt, right-click and see what pops up. Subtab – refers to a display control, contained in a tab, where the actual information display takes place, i.e. tables, charts, etc. The gene data visualization tab and the application tab display a relatively small number of subtabs. However, the project data and data visualization tabs can display a significant number of subtabs for all the data, analysis results, and corresponding data visualization. It will be up to you to explore the application and see all that’s available. Column sorting – if you click on a column header (where the column name is displayed) you can sort the table rows based on the contents of that column. If you click on the same column header multiple times you go through a cycle: ascending sort, descending sort, and clear sort. You may also sort by multiple columns. To do that, you click on the first column you want to sort by and then you hold the shift key and click on the next column you want to sort by. An example would be to sort by the DSA Results column in the DSA results table and then shift-click on the Q-Value column to see them in order. Show/hide columns – if you look at the top right corner of the table, you will see a small plus sign on a green background. If you click on it, a drop down menu will appear, see table image below. Each column will be displayed as a menu selection and the columns currently shown will have a check mark by them while the ones that are not shown will not. You may toggle the show/hide status by clicking on the column menu selection. If applicable, depends on the table, you may also add special annotation feature columns, on a need to basis, using the «Add annotation feature column…» menu selection at the bottom. You should only add annotation feature columns if you intend to use them for filtering. If you add the feature name/description column, be aware that some annotation features have long descriptions, such as GO terms, and can use up a considerable amount of memory. You may export the table data to file via the export menu button on the subtab bar or via the table’s context menu. Table search and row selection functionality is covered in the Ad Hoc Query section. If you double-click on the display, it will zoom in. If you hold the shift key down and double-click on the display, it will zoom out. Given the nature of the display contents, zooming only affects the horizontal axis. The same functionality is provided in the subtab bar using the zoom buttons, see Subtab Menu Bar section. Panning refers to ‘dragging’ the display area around with the mouse. It is typically done by pressing the left mouse button button down, on an empty area of the display, and keeping it down while moving the mouse around to ‘drag’ the display area. Data visualization display subtabs are provided for most data tables in the application. The easiest way to access data visualization for a specific table is to click on the data visualization button provided in the data subtabs and then choose from one of the menu item selections, see image below. Alternatively, you may use the Graphs menu button on the application’s top tool bar and select accordingly. Once you make a selection, the data visualization subtab will be shown in the project’s data visualization tab, see image below. 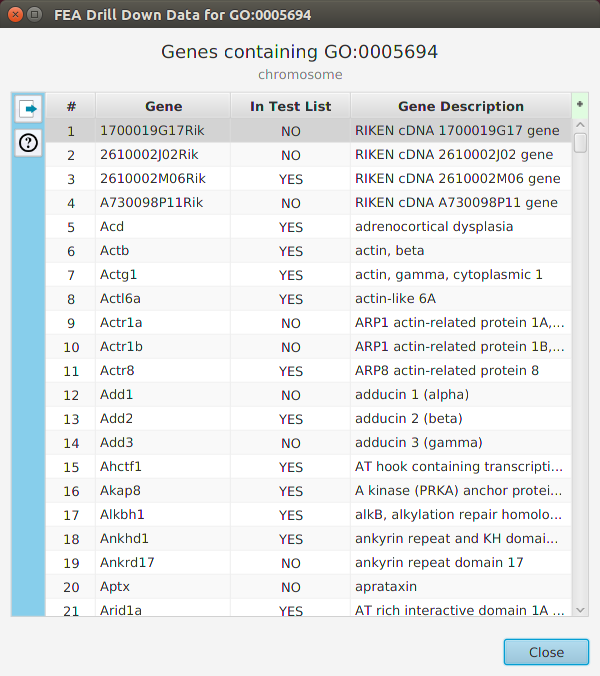 To access the visualization data for a specific gene, right click on the table row containing the gene of interest, for example the gene data table or the DIU results table, and click on the ‘Show gene data visualization’ menu item selection in the context menu. See Context-Sensitive Menus section. You may use the slide control buttons below to see all gene data visualization subtabs snapshots. The ability to see the underlying data details can be extremely helpful and is provided, where relevant, via context-sensitive menus. As previously discussed in the Context-Sensitive Menussection, the data table row that you right-click on will determine the contents of the drill down data. For example, in the FEA results for Gene Ontology features window, shown below, the context menu provides a selection to drill down data. Once selected, the drill down data window will be displayed, see image below. Note the drill down data is for «GO:0005694» which is the selected table row. 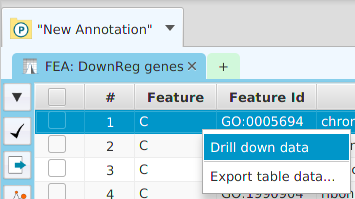 You may export the drill down table data and, for this specific example, view gene data visualization for specific genes via context menu. You may export all table data and data visualization images – such as charts, graphs, etc. – in the application to file. Items list (IDs only) – export only the item IDs, where item refer to genes, transcripts, etc. Items ranked list (IDs and values) – export the item IDs and primary statistical result values, where item refer to genes, transcripts, etc. Once you select the data to export, the standard ‘specify file’ dialog window, provided by the Operating System in your computer, will be displayed so you can choose what file to export the data to. Just like in the data export, the image export function may be accessed via context-sensitive menu or via the Export menu button on the subtab menu bar. However, there are no options for exporting images; once the export function is invoked, the ‘specify file’ dialog window will be opened directly. All images are exported in Portable Network Graphics (PNG) file format. 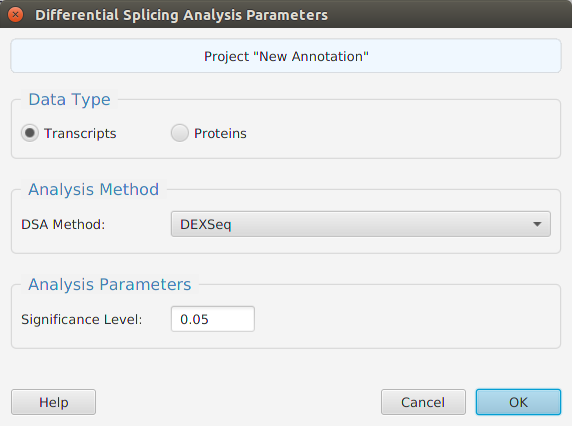 Differential splicing analysis can be performed for transcripts or proteins, see image below. Just like in the normal DIU using transcripts, using proteins allows checking for differential splicing at the protein level. Protein levels for DIU are calculated using the sum of their corresponding normalized transcript expression levels within the same gene. 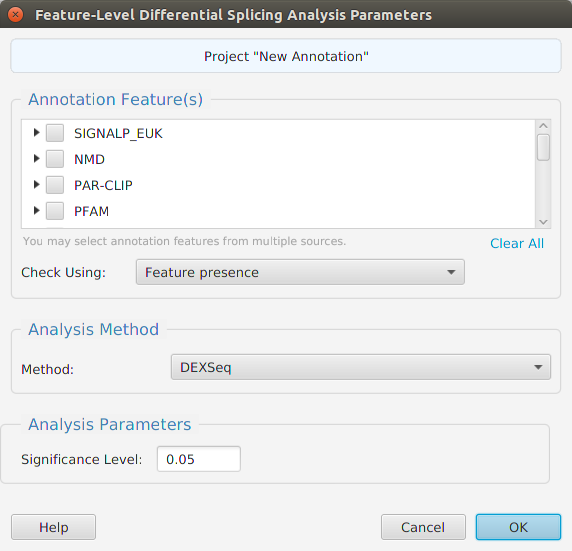 You may choose which R package to use, DEXSeqor edgeR, for DIU Analysis. When using the application, all DIU parameters are described in the Help page which can be accessed via the Help button located on the bottom left of the dialog window. Also, be aware that you do not need to rerun the analysis to change the significance level value: a menu button is provided in the subtab menu bar, see Subtabs Menu Bar section, to change the significance level value and recalculate the DS/NotDS results. The DIU results are displayed in a table on the DIU Results subtab. The subtab is contained in the project data tab located in the top tab panel, see image below. It includes basic informational fields such as gene and gene description. It also includes the results, DS/NotDS, Q-Value or P-Value, depending on the R package used, Total Change, and Podium Change. 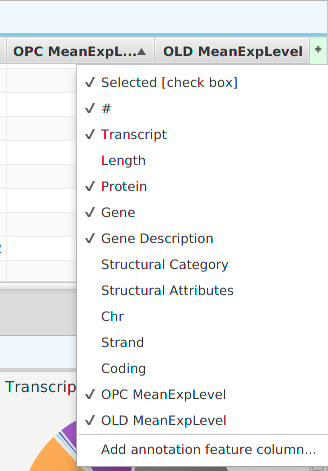 Podium change is used to indicate if the most expressed transcript or protein, depending on the data type selected, changed between conditions. The mean normalized expression levels for each condition are shown for each row. Be aware that you do not need to rerun the analysis to change the significance level value: a menu button is provided in the subtab menu bar, left part of the image, to change the significance level value and recalculate the DIU/NotDIU results. When running the application, a description of all fields in the result table can be viewed using the subtab Help button. When using the application, all FDA parameters are described in the Help page which can be accessed via the Help button located on the bottom left of the dialog window. The FDA results are displayed in a table on the FDA Results subtab. The subtab is contained in the project data tab located in the top tab panel, see image below. Each table row displays the diversity results for a given gene. The result columns are grouped into transcript, protein, and genomic annotations. Each column within a group displays the Varying/NotVarying results for the corresponding feature. Blank row cells indicate the feature was not present for the given gene. The FDA Summary data visualization subtab provides results summary information. The subtab is contained in the project data visualization tab located in the bottom tab panel, see image below. The chart on the left provides varying percentages for each annotation feature at the gene level. 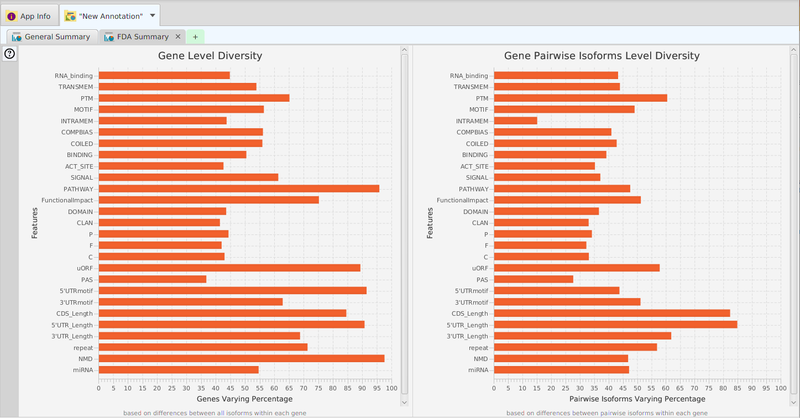 The chart on the right provides varying percentages for each annotation feature using pairwise gene isoforms comparisons. As expected, the varying percentages using the pairwise isoforms are lower. To perform Feature-level differential splicing analysis, you choose what features you will like to include. You also need to specify if you want the features among gene isoforms to be compared using presence or genomic position overlap. The former just checks for the feature being present and having the same count. The latter checks for a genomic position overlap match for each instance of the feature. Just like in regular DIU, you may choose which R package to use, DEXSeq or edgeR. When using the application, all DFI parameters are described in the Help page which can be accessed via the Help button located on the bottom left of the dialog window. The DFI results are displayed in a table on the DFI Results subtab. The subtab is contained in the project data tab located in the top tab panel, see image below. Each table row displays the same information as in the regular DFI, the difference being in the rows containing a specific annotation feature in addition to the gene. The DFI results summary table summarizes the results by feature. For each feature, it displays the number of feature DIU genes detected as well as the number of tested and total genes. Tested genes is the actual number of genes tested for DIU, that is genes having multiple isoforms and varying feature. Total genes is the number of genes containing the feature. The number of DIU genes favoring each condition is also displayed. Each table row displays the same information as in the regular DIU, the difference being in the rows containing a specific annotation feature in addition to the gene. The DFI results gene association table explores the association of two features to any given gene. For each pair of features, it displays the number of genes where both features were found to be DS. In addition, the counts for genes where the features were favored in the same or opposite conditions are shown.